In stock -This product will ship today if ordered within the next 14 hours and 37 minutes. 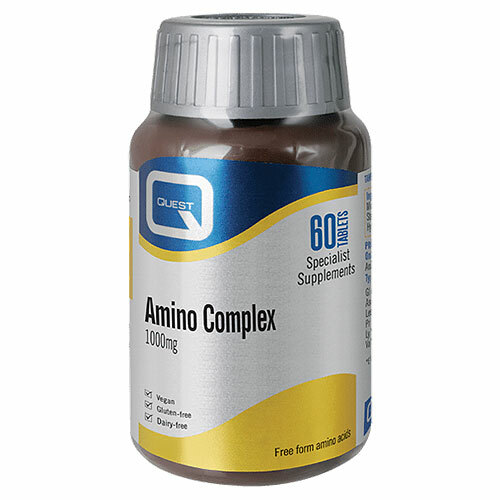 Quest Amino Complex 100mg provides a blend of seventeen amino acids including the eight essential amino acids that can only be obtained from the diet. Amino acids are used by the body to form working proteins, such as enzymes and hormones, which drive the biological functions that sustain life. Amino acids also form, build and maintain structural proteins in our body. Below are reviews of Amino Complex 1000mg - 8 Amino Acids - 60 Tablets by bodykind customers. If you have tried this product we'd love to hear what you think so please leave a review. Quest Amino Complex 1000mg provides a blend of seventeen amino acids including the eight essential amino acids that can only be obtained from the diet.